Lord, teach us to pray . . . (Luke 11:1). The prayer of Abraham and Jacob is presented as a battle of faith marked by trust in God's faithfulness and by certitude in the victory promised to perseverance (Catechism of the Catholic Church, 2592). In the battle of prayer we . . . must respond with humility, trust, and perseverance to these temptations which cast doubt on the usefulness . . . of prayer (Catechism of the Catholic Church, 2753). I’ve lost count how often I’ve nearly given up hope that some of my prayers would ever be answered. And I admit it’s difficult to keep asking the same thing year after year after year, when it seems my prayers get no higher than the ceiling. Then one morning during a particularly disquieting lack-of-faith time in prayer, the Lord reminded me of the “Our Father” Jesus taught His disciples. “Pray this way,” He said. “ . . . Thy kingdom come, Thy will be done, on earth as it is in heaven.” And I mused on those words awhile. For two thousand years Christians all over the world have prayed the “Our Father.” Many, every day. Two thousand years. That’s close to a bazillion prayers over time. Nonetheless, God’s kingdom is still not come to earth, nor is His will perfectly done on earth – especially the salvation of humanity (2 Peter 3:9) – as it is in heaven. Suppose one of you has a friend, and goes to him at midnight and says to him, ‘Friend, lend me three loaves; for a friend of mine has come to me from a journey, and I have nothing to set before him’; and from inside he answers and says, ‘Do not bother me; the door has already been shut and my children and I are in bed; I cannot get up and give you anything.’ I tell you, even though he will not get up and give him anything because he is his friend, yet because of his persistence he will get up and give him as much as he needs. So I say to you, ask, and it will be given to you; seek, and you will find; knock, and it will be opened to you. For everyone who asks, receives; and he who seeks, finds; and to him who knocks, it will be opened. I think it important to note the Greek verbs here for ‘ask’, ‘seek’ and ‘knock’ can also be translated, “keep asking,” “keep seeking,” “keep knocking” – which makes better sense considering the context of the passage. Persist. Persevere. Don’t give up. Keep asking. Keep seeking. Why? I guess because, well – because God says to. I don’t understand why sick people don’t get better, why children go astray, why families shatter, why finances fail, why . . . why . . . why. I don’t understand why heaven sometimes seems like brass, or why Christians sometimes die without ever seeing their most fervent prayers answered. For though the fig tree does not blossom, and no fruit appears on the vine, though the yield of the olive fails and the terraces produce no nourishment, though the flocks disappear from the fold and there is no herd in the stalls, yet I will rejoice in the Lord and exult in my saving God (Habakkuk 3:17-18). Behold, days are coming, declares the Lord God, When I will send a famine on the land, not a famine for bread or a thirst for water, but rather for hearing the words of the LORD (Amos 8:11). God’s prophets and saints warned of. Jesus said to them, “Are you not misled because you do not know the scriptures or the power of God? (Mark 12:24). or the mercy of God. Behold, the virgin will conceive . . .
During this Advent season I have been posting some essays from my first book, We Believe: Forty Meditations on the Nicene Creed. This one is about the Virgin. Creed Statement: By the power of the Holy Spirit He was born of the Virgin Mary . . .
And Mary said: "My soul proclaims the greatness of the Lord; my spirit rejoices in God my savior. 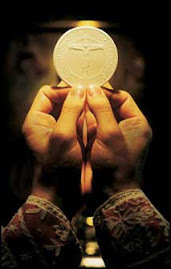 For He has looked upon his handmaid's lowliness; behold, from now on will all ages call me blessed" (Luke 1:46-48). Why did God choose Mary to bear His Son? What did He see in her that moved Him to select the Virgin to nurture, comfort, and educate the Savior of the world? We don’t know. Scripture is silent. But we can infer several reasons from what Scripture does tell us. And Mary knew Scripture. In an era when catechists didn’t consider it a priority to teach Scripture to girls, it's clear Mary read and memorized God’s word. Her adoration of God (Luke 1:46-55) is an example. She quotes or alludes to at least six Old Testament texts in those short eleven verses (1 Samuel 2:1-10, Psalm 34:2, Psalm 35:9, Psalm 98:1, Psalm 103:17, Psalm 107:9). Mary applied what the Psalmist declared centuries earlier, “Your word is a lamp for my feet, a light for my path” (Psalm 119:105). Mary also demonstrated humility. She could have told the angel, “You’re asking too much of me. Send someone else.” But instead, she answered, “May it be done to me . . .” In other words, she said not her will, but God’s. Not her plans, but His. Perhaps as she spoke, she remembered Solomon’s conclusion in Ecclesiastes, “The last word, when all is heard: Fear God and keep his commandments” (Ecclesiastes 12:13). Perhaps she remembered the Proverb, “Charm is deceptive and beauty fleeting; the woman who fears the Lord is to be praised” (Proverbs 31:30). Further, Mary presented herself obedient to God. "Behold, I am the handmaid of the Lord.” If Eve, the Mother of mankind, had answered God as Mary, and not disobeyed the Father’s commandment about the forbidden tree, salvation history would be different. But Eve disobeyed, and Mary, by her obedience, fixed what our first mother broke. Mary proved herself chaste. “For from the heart,” the Lord Jesus said, “come evil thoughts, murder, adultery, unchastity, theft, false witness, blasphemy. These are what defile a person . . . " (Matt 15:19-20). Mary knew none of these. She was a virgin not only in flesh but also in spirit. And finally, if there is a final word about the Mother of God, Mary didn’t model herself after the world, but let love for God transform her into a useful vessel for Him. No wonder He chose her to carry and mother His Son. When we recite, “He was born of the Virgin Mary,” we remind ourselves to imitate her, to clothe ourselves with obedience, humility, courage, purity and knowledge of God’s word. God chose Mary to bring Christ into the world. By imitating Jesus’ mother, we bring Him to our world. Prayer: Holy Mary, Mother of God, pray for us sinners, that we will learn to love God with all our heart, soul, mind and strength. Amen. Since we are in the midst of Advent -- the time when Christians reflect on the first coming of Jesus -- I thought to continue posting a few excerpts from my first book that speak to Christ's first advent (Oh, how I await His second!). Nicene Creed Statement: By the power of the Holy Spirit He was born of the Virgin Mary, and became man. At unexpected times, my memory’s eye catches glimpses of my deceased father. I see him in myself when I’m lost in thought and absently rub my fingers the way he used to. I see him sit ramrod straight when I hold my shoulders as he did. I see him in the mirror when I hold my chin a certain way to shave. His movements and patterns remain ingrained in my subconscious long after his death. But that I see him so often in myself shouldn’t surprise me. Children typically imprint some of their parents’ characteristics. What kind of man was Jesus? How did He live and what were His habits? We do well to answer these questions because in learning to imitate Christ, we imprint His Father’s characteristics onto our subconscious and grow more closely into the image of God (2 Corinthians 3:18). He was a Man of prayer. St. Luke wrote, “But the news about Him was spreading even farther, and large crowds were gathering to hear Him and to be healed of their sicknesses. But Jesus Himself would often slip away to the wilderness and pray” (Luke 5:15-16). He was compassionate. “At the sight of the crowds,” St. Matthew records, “His heart was moved with pity for them because they were troubled and abandoned, like sheep without a shepherd” (Matthew 9:36). He possessed an intimate knowledge of the Scriptures. He quoted as easily from Moses as from the Prophets, from the Psalms to the Writings. He was passionate for holiness. “Take these out of here,” He commanded the moneychangers. He turned over their tables, tossed their coins across the floor, and chased them from the temple. “Stop making My Father's house a marketplace" (John 2:16). And He was a Man of humility. How can we understand the eternal Second Person of the Trinity, clothed in the flesh of a man, and yet He washed His disciples’ feet? When we recite the Creed and focus on God who became Man, we can take the opportunity to meditate on His life of prayer, holiness, humility, compassion, and knowledge of Scripture. And by meditating, we can learn to imitate Him who fully reflects the Father. Prayer: Holy Spirit, make me as a child in my Father’s arms. Open my eyes to observe Christ’s life, His habits, His passions. Imprint those things on my heart that I may walk as He walked. Amen. Nicene Creed Statement: By the power of the Holy Spirit He was born of the Virgin Mary . . . Behold, the virgin shall be with child and bear a son, and they shall name Him Emmanuel, which means "God is with us" (Matthew 1:23). I remember our excitement when Nancy and I learned she was pregnant with our first child. It happened more than thirty years ago, but the memories remain vivid. We waited with growing anticipation during the nine months as her abdomen slowly expanded. We watched in awe as her belly rippled when Keren stretched in the womb. We busied ourselves with planning and shopping and decorating the nursery long before we brought our baby home. Our daughter was born March 12, 1977 in a warm, hygienic hospital delivery room. The obstetrician handed Keren to a nurse, who wiped her with a soft towel, wrapped her in a blanket, and carried her to Nancy’s arms. What parent doesn’t hope his or her child will enter the world snuggled in a warm blanket, laid in a comfortable bed, and watched over by an adoring family? And if anyone might have expected that kind of experience, Mary and Joseph surely did. After all, the Virgin carried the Son of God within her womb, conceived through the miraculous intervention of the Holy Spirit. Babies just don’t get any more special. But when His parents arrived in Bethlehem, the town was already swollen with strangers. Joseph and Mary, tired and hungry from their journey, longed for a place to bathe and a bed to let their weariness give way to refreshing sleep. Instead, Joseph searched in vain for a clean and comfortable place for his wife to lie down. They settled for the night with cattle and to the smell of manure and rotting straw. To make an uncomfortable situation worse, Mary went into labor. Why did God bring His son into the world in a barn instead of a manicured palace? Why did He permit His Son to be born far from family and friends who could nurture the Infant and help the new mother care for Him? I don’t know. That’s not the way I’d have done it. But were I to guess, I’d say it happened that way so God could demonstrate from the very beginning of His work for our salvation that “Emmanuel” really does mean God is with us – in our poverty, complete with rotting straw, manure and flies. The Nicene Creed reminds us Jesus was born as most of humanity is born: in humble surroundings with the most meager of necessities. Christ knows the fullness of our harshest experiences because He lived through them – from a feeding trough to a splintered cross, with the Via Dolorosa – the Way of Suffering – between the two. Jesus’ birth – like His life – is God’s assurance that He is intimately connected to our humanness. He understands our loneliness, our sorrow, our confusion. And through it all, He remains only a prayer away from drawing us to Himself, wrapping us in His arms and wiping us clean with His blood. Prayer: Father of the Lord Jesus Christ, when I am rushed and confused, compose and quiet me. Make my heart like a comforted child, not looking at my circumstances, but always to You, my shelter, my anchor, my peace. Amen. The Nicene Creed is one of the earliest statements of authentic Christian faith. 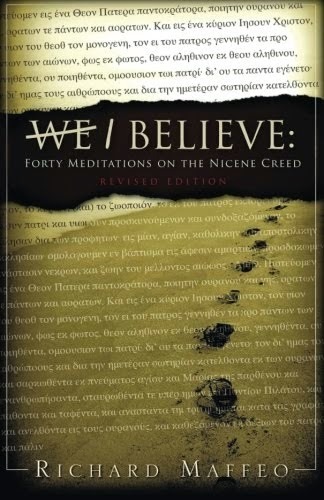 And, since we are in the midst of Advent -- the time when Christians reflect on the first coming of Jesus -- I thought to post a few excerpts from my first book, "We Believe: Forty Meditations on the Nicene Creed." The translation of the Creed from Latin to English changed at the beginning of Advent to bring it closer to the original Greek. Eventually I will revise my book to mirror the few changes that were made. Creed Statement: We believe in one Lord, Jesus Christ, the only son of God, eternally begotten from the Father, God from God, Light from light, true God from True God, begotten, not made, consubstantial (one in being, of the same substance) with the Father. In 325 A.D., Church leaders met in council in Nicea (modern-day Turkey) to deal with the Arian heresy. The Council leaders knew that the wrong answer to the question of Jesus’ deity would inevitably spread through the Church’s understanding of sin, salvation, atonement and forgiveness. Mankind’s eternal destiny was at stake. To help the Church get the right answer, the Nicene Council responded in what I like to think of as the equivalent of clearing their throats. In this case, however, they clapped their hands and blew a trumpet in a rising crescendo, as if to say, "Hey! Pay attention! This is really important." So we couldn’t miss the point, the Fathers gave us the correct answer seven times in one sentence proclaiming Jesus is: The only son of God; eternally begotten from the Father; God from God; Light from light; True God from True God; begotten, not made; consubstantial with the Father. Yet, despite the seven-fold response, some got it wrong. Some still do. Prayer: Father, thank You for sending the Holy Spirit to Your Church. Help us humbly receive His instruction in things necessary for our good and for our salvation. Please protect our minds from the devil’s deceptions. Amen. I published this before. It bears repeating. This incident happened to me somewhere around 1978. Thirty-three years ago. As I get ready to post this to the blog, I can still see myself sitting in the driveway, staring at the clouds. Thirty three years. Has it really been that long? Please, trust Him. Thought the earth should shake; Though the mountains fall into the depth of the sea, He will never forget His child. In God I have put my trust, I shall not be afraid. What can mere man do to me? (Psalm 56:4). I tried in vain to control the tears. But without a job, two small children at home and a third on the way, despair settled over me like a thundercloud. "God," I wept aloud. "What am I going to do?" I wiped my eyes with my sleeve and glanced quickly at the traffic around me. It was bad enough if someone would see a grown man crying, but I didn't want to also be seen talking to myself. Following what I believed to be His guidance several years earlier, I took my family and left the security of military life to attend college. But after graduation, as opportunities for jobs evaporated, I could only wonder if I had misunderstood His call. And now, after suffering another lay‑off from my job, I faced an ever growing pile of over‑due bills. "For I know the plans that I have for you," I reminded the Lord of the Scripture which years earlier encouraged me, ". . . to give you a future and a hope” (Jeremiah 29:11). Then I repeated a litany of reasons why I thought He had not lived up to His part of the bargain. But it was no use. My throat ached from the lump still stuck in its midst. Heaven seemed glazed over with concrete. As I pulled into our driveway, I absently scanned the sky toward the horizon. Wisps of cirrus clouds hung lazily across the light blue expanse. I sat nearly motionless for a few minutes, drained and worn out from crying. And then I did the only thing left open to do. I breathed in quiet surrender: "Lord, I still trust you." Nothing changed overnight. We continued to eke out enough money to keep food on the table, the rent paid and the electricity turned on. But something felt different. Inexplicably different. Without understanding how or why, I sensed my confidence in Him grow. I suppose I had reached a turning point. Some weeks later the phone rang. My former employer needed me back to work. Could I report that evening for the night shift? In a world of ever shifting plans and programs, where the only thing constant is change, the Biblical message stands as unshakable as God Himself: "He shall be the stability of [our] times, a wealth of salvation, wisdom and knowledge" (Isaiah 33:6). When heaven appears brass and the ear of the Lord seems dull, God ever remains faithful and "intimately acquainted with all [our] ways" (Psalm 139:3). Sometimes through life's angry thrashings we may forget that. And it is to our disadvantage when we do, for it is often just those times of turmoil which drag us face to face with ourselves, forcing our resolve to trust God despite . . . and in spite . . . of circumstances. Sort of like our personal turning point. I have learned it time and again . . . and re-learned the lesson more times than I should have needed: though the earth may quake and mountains are cast into the sea, the heavenly Father knows our name and He knows our address. And that alone is enough to sustain me. I pray it is enough to sustain you. The Church teaches on the parable of the merciless servant: [Jesus said] "So also my heavenly Father will do to every one of you, if you do not forgive your brother from your heart." It is there, in fact, "in the depths of the heart," that everything is bound and loosed. It is not in our power not to feel or to forget an offense; but the heart that offers itself to the Holy Spirit turns injury into compassion and purifies the memory in transforming the hurt into intercession. (Catechism of the Catholic Church, 2843. Bold is my emphasis). In the last essay I wrote about confession as a prayer strategy. Today I’ll address forgiveness, and how this “strategy” opens or closes the gates of heaven to our prayers. The Lord Jesus made it clear in many places that God’s forgiveness of us is inextricably linked to our forgiveness of others. Perhaps the clearest example of this principle is found in the verses just after the “Our Father” in which Jesus warns, “If you forgive others their transgressions, your heavenly Father will forgive you. But if you do not forgive others, neither will your Father forgive your transgressions (Matthew 6:14-15). Forgiveness is a choice. It is an act of the will, independent of our ‘feelings’ of forgiveness. It’s the choice Jesus made when He prayed for the Father to forgive those who mocked and crucified Him – even though they had not asked for forgiveness. It’s the same choice St. Stephen made when, as he was dying at the hands of the mob stoning him, he asked the Father to not hold that sin against them – even though they had not asked for forgiveness. Everyone who has read my books knows I killed my baby more than 40 years ago in an abortion clinic. Four years later, when I discovered Jesus was the Jewish Messiah, I offered Him my life, repented of my sins, and entered the waters of baptism. For the next 44 years I was (and remain) absolutely certain God forgave not only that terrible crime, but all of my other despicable offenses against Him as well. However, in early October 2011, while watching a DVD at a men’s meeting devoted to the subject of abortion, I had a terrible epiphany. As if for the very first time my eyes opened to the bottomless depth of my abortion sin. A sword of shame ripped into my gut. Blood gushed from the wound and my bowels lay eviscerated on the floor. Guilt – horrifying, unrelenting guilt – flooded over me like a tsunami, first sucking away my breath, only to return relentlessly churning and tossing ravaged, grievous memories through my heart. I couldn’t watch any longer. I grabbed my coat and rushed from the building. It was all I could do to get into my car before uncontrollable sobs wracked my body. I could not fathom why God, who’d forgiven me four decades earlier, who’d buried my crimes in the sea of Christ’s blood – why had He brought me to my knees like this? It was not until hours later, after struggling to process what God had done to me, that I understood. That is to say, I think I understood. I had never before known such grief for my sin. But neither had I known for what and for how much He had forgiven me. And then the Holy Spirit connected the proverbial dots. Like the slave in Jesus’ parable cited in the Catechism paragraph above, who do I think I am to keep a grudge against another? What gives me the right to hold an unforgiving spirit toward family, friend – or even enemy? I owed God a debt that I could never repay. But He paid my debt in full. Every penny. And He paid it with His blood. Do I really think I can live close to Christ if I am unwilling to live as Christ? Do I really think I can hope for His forgiveness if I remain unwilling to forgive others – even those who don’t ask for forgiveness? I learned on that day in October that of all the prayer strategies I could ever practice, if confession and forgiveness are not at their core, I might as well stop jabbering at God. I learned that forgiveness is a choice. And that by exercising the right choice, I permit the Holy Spirit to supernaturally turn injury into compassion and hurt into honest intercession. Lord Jesus, please. Conform my choices more and more to yours. I published this some time ago. I thought to post it here. Thirty years. That's how long it had been since I last saw my childhood home. I stepped out of the car and walked along the cracked sidewalk toward the aging red‑brick buildings Memories flooded my mind. Privet hedges, probably the same ones I ran through as a child, lined the perimeter of the large grass area separating either side of the three‑story buildings. The gnarled maple towered above the empty playground to my right. I used to hang upside down on those monkey‑bars. A little further I turned a corner. There it was: 2210. The bold black numerals above the stone entryway stood out in contrast to the graying concrete. I pushed the green wooden door open and stepped through a time portal. Everything was just as I remembered, yet at the same time seemed so different. As a child, the cavernous hallway extended for miles. Now claustrophobia settled over me. I stepped onto the black-tiled stairs and climbed two at a time until I reached the third floor landing and stood outside my old apartment. Funny thing, the rust‑brown metal door no longer loomed monstrously large as it did years earlier. We understand our world through our senses. However, sight, taste, touch, smell and hearing limit us to physical realities. They do little to help us understand important, yet intangible things such as knowing the assurance of God's love, or His comfort in the midst of sorrow. Such things defy our senses because they’re rooted in what Scripture calls faith - the substance of things hoped for, the evidence of things not seen (Hebrews 11:1). Perceptions rooted in the natural senses can deceive. Consider when the Syrian army surrounded Elisha (2 Kings 6:14). When Elisha's servant looked out over the horizon, his stomach turned itself over in knots. The situation appeared hopeless. Defeat seemed inevitable. But Elisha looked beyond natural vision and watched heaven’s chariots swarm to their rescue. The physical evidence did not change. Syria remained massed for battle. But the spiritual evidence perceived through eyes of faith brought peace where fear reigned. How ought we as Christians view darkened shadows and cavernous hallways? How shall we view doors that loom monstrously large before us, or enemies massed on our horizons? As Elisha, or as his servant? What battles do we face? Chronic illness? Loss? Poverty? Divorce? Satan will try to keep us so busy flailing and cowering for protection that we forget who really is in charge. He wants us to forget though the battle is arrayed against us, the chariots of God encamp around God's people (Psalm 34:7), the God of Elisha still reigns, and victory still belongs to the Lord. 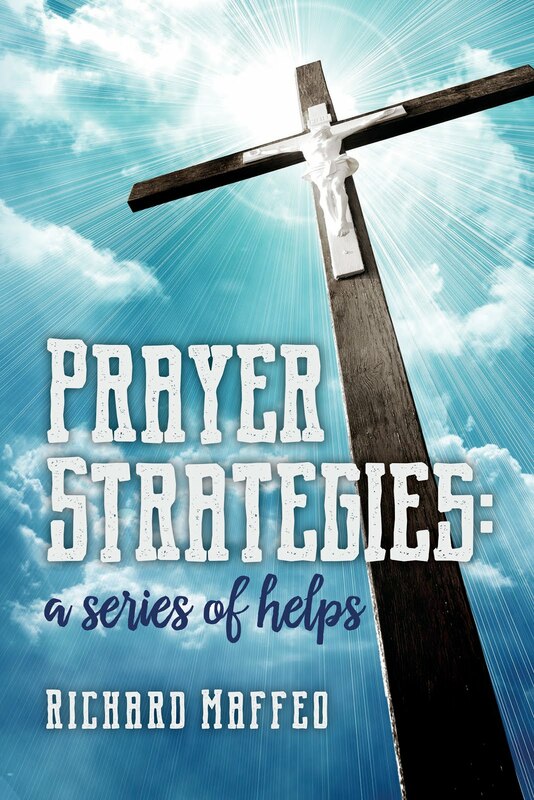 Another prayer strategy I use is ‘imaginative prayer.’ I thought I had invented imaginative prayer. Just goes to show how little I knew -- and know -- of prayer. My use of the Rosary as a prayer tool initiated me to the practice. For readers unfamiliar with the Rosary, I posted links to information in my last Strategy blog to help explain its history and its use. You can follow these links here and here. I do not use the Rosary as traditionally prayed, but modify it to better meet my prayer and worship needs. When I ask someone to pray for me, I usually tell them what I need prayer for. And so, I modify my petition on the ‘Hail Mary’ beads this way: Hail Mary, full of grace, the Lord is with you. Blessed are you among women, and blessed is the fruit of your womb, Jesus. Holy Mary, mother of God, please pray for (name of a person, or a situation). Amen. (For readers familiar with the Gospel of Luke, you might have recognized two portions of Scripture in the Hail Mary – Luke 1:28 and 1:42). The Rosary also includes the recitation on the Apostles’ Creed, the ‘Our Father’ (the Lord’s Prayer) and the ‘Glory Be’. By the time I’m through these sections of the Rosary, 20-30 minutes might have passed because I take time to reflect on specific words or phrases in those prayers. This is in addition to the half hour or so I spend reading Scripture and worshiping Jesus through music CDs. But I don’t like to leave the Rosary without meditating on at least one of the Mysteries. For readers unfamiliar with the Mysteries, please follow this link. It was during my meditation of the Mysteries that I stumbled on what I thought was my invention of ‘imaginative prayer.” I later discovered people have practiced imaginative prayer for centuries. St. Ignatius of Loyola wrote of that prayer method in the 15th century. When I searched the internet for other explanations of the practice I found many sites. Here is one link (click here). As I meditate on one of the Mysteries of the Rosary, I focus on that particular time in Jesus’ life. For example, one of the Mysteries has to do with His flogging. I imagine I am there, in the courtyard. I try to smell the dust swirling in the wind, to hear the mob’s shouts behind me, to watch His mother crumble with grief as the soldier’s whip slices Jesus’ back. Click this link to read my essay resulting from such an imaginative moment. Another Mystery – the Resurrection – resulted in this essay. Scripture is replete with stories and vignettes that easily lend themselves to imaginative prayer – yet another strategy to engage us more deeply into the art and practice of communion with God. I’ll post another of my strategies in a few days.